Port Arthur, Texas, August 31, 2017. 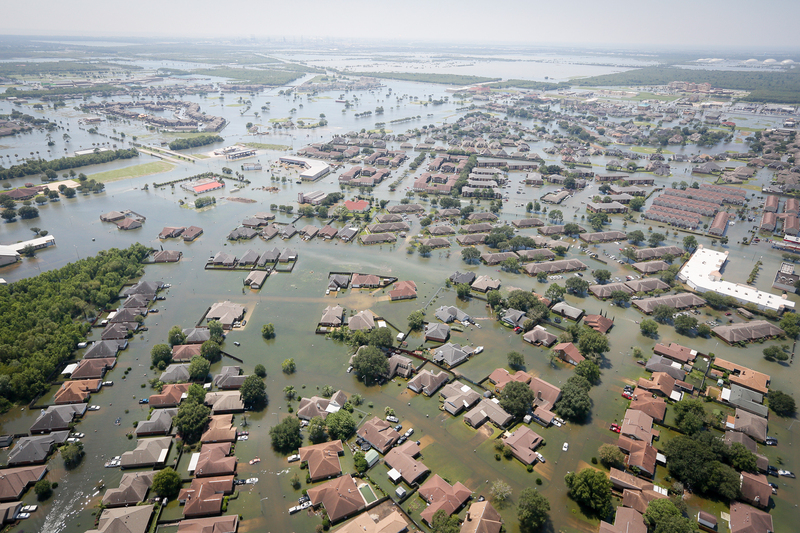 Hurricane Harvey is tied with 2005's Hurricane Katrina as the costliest tropical cyclone on record, inflicting $125 billion (2017 USD) in damage, primarily from catastrophic rainfall-triggered flooding in the Houston metropolitan area. It was the first major hurricane to make landfall in the United States since Wilma in 2005. Winds left residents throughout Barbados without electricity. Strong winds and heavy rainfall also affected Suriname and Guyana. After striking land, Harvey rapidly weakened as its speed slowed dramatically to a crawl, and Harvey weakened to a tropical storm on August 26. For about two days the storm stalled just inland, dropping very heavy rainfall and causing widespread flash flooding. Harvey's center drifted back towards the southeast, ultimately re-emerging into the Gulf of Mexico on August 28. Harvey caused at least 107 confirmed deaths: 1 in Guyana, and 106 in the United States. The remnants continued northeastwards, before being absorbed into another extratropical system on September 3.